Today I am going to show you all what’s new in our shop for this month! Spring is in the air, but the cold hasn’t left just yet. We’ve been working hard to try to bring you new products that show off the look of spring, but still give you the warmth you need for those cold nights! 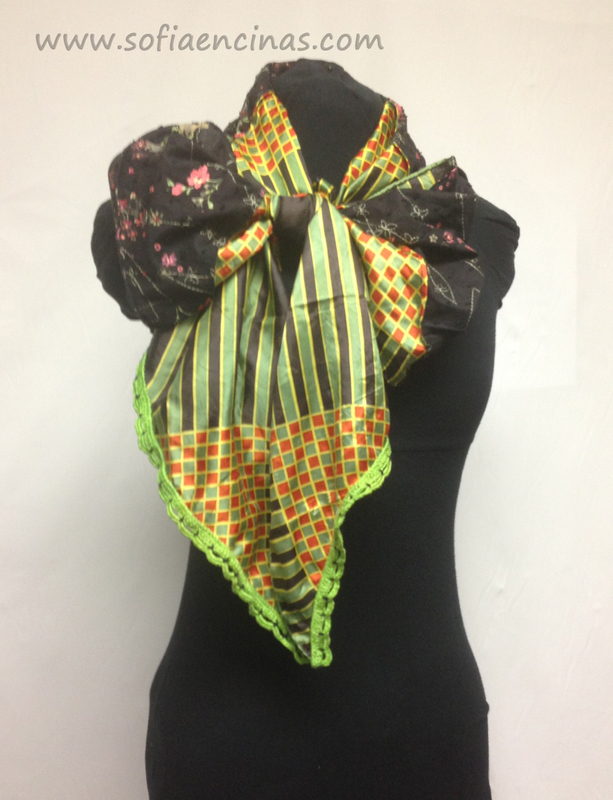 All our designs are made upcycling fabric or products already in existence. We pride ourselves on being eco-friendly as well as innovative, trying to come up with new, fresh, inspired ideas everyday!. I hope you like our new products for this month. We also have a piece or two on sale for you, so don’t miss out!! 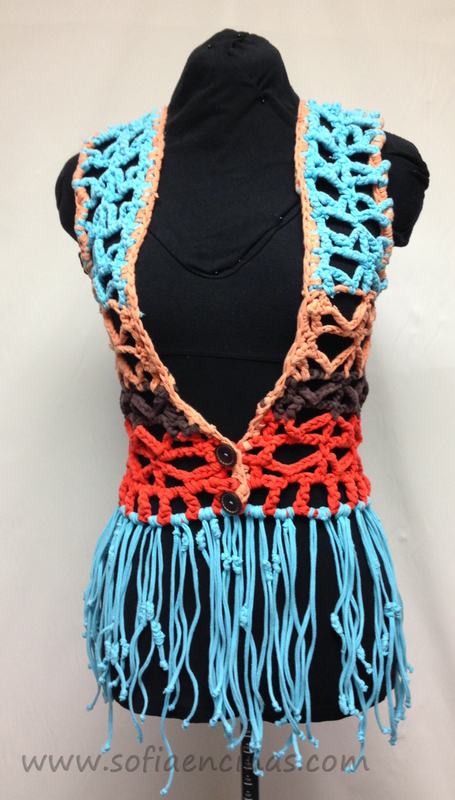 This first piece is a Vintage Crocheted Vest with Tassels along the bottom. 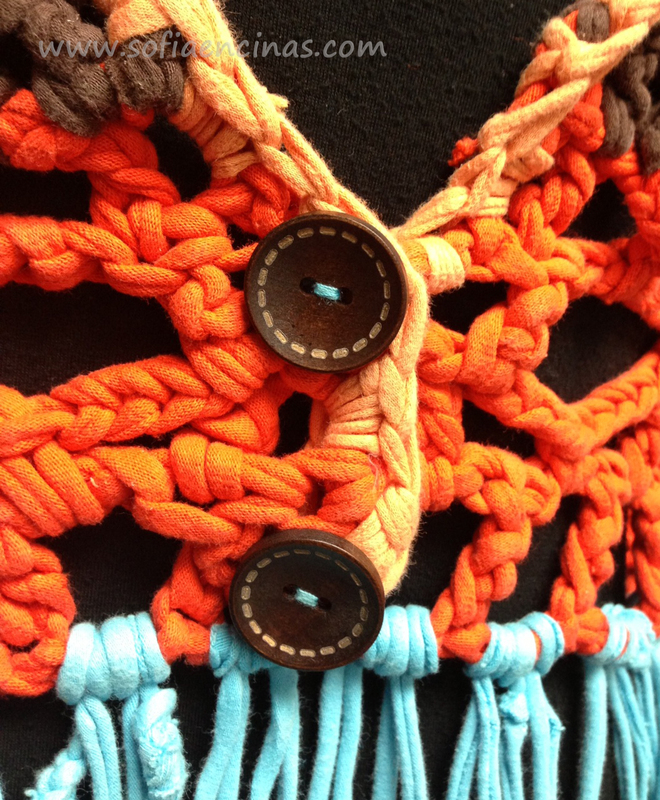 This vest is full of warm earth-tones such as orange, red, brown, pink and blue. It has a two button closure on the front made from vintage wooden buttons. 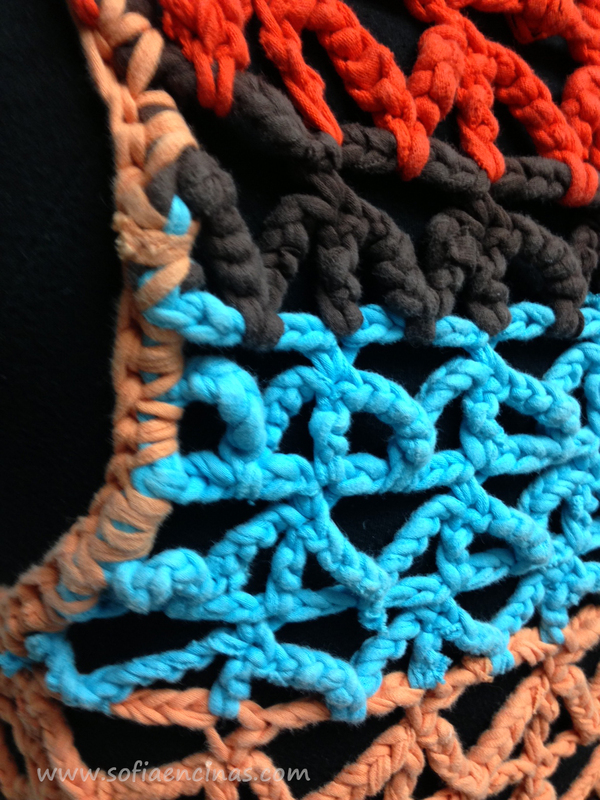 The vest is crocheted in a triangular pattern using modern crochet techniques, however instead of thread, this original vest is made from t-shirts linked together and crocheted. This means that the gauge is going to be a little bit bigger and you won’t have problems with it fraying or coming apart in the wash. 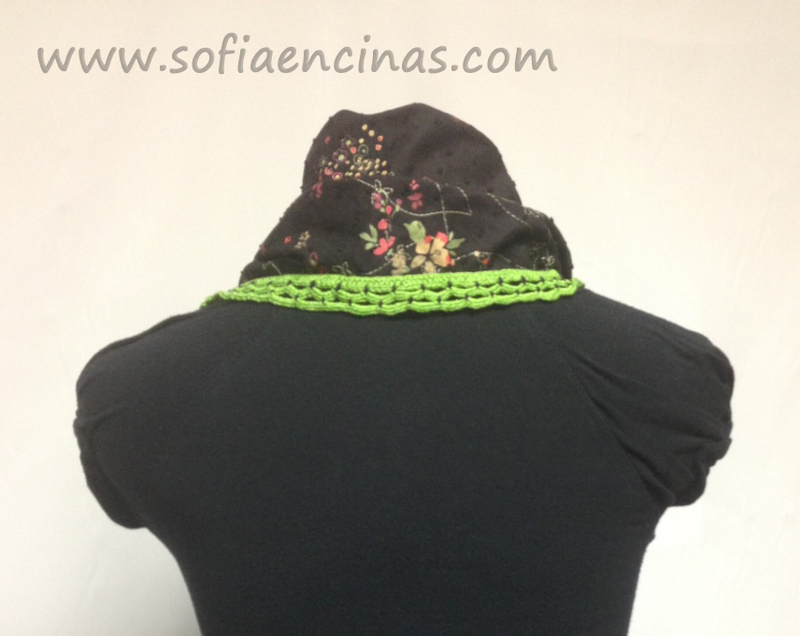 The bottom tassels are also made out of t-shirt pieces, and each one is knotted on the end to give a little bit more texture and style to the vest. 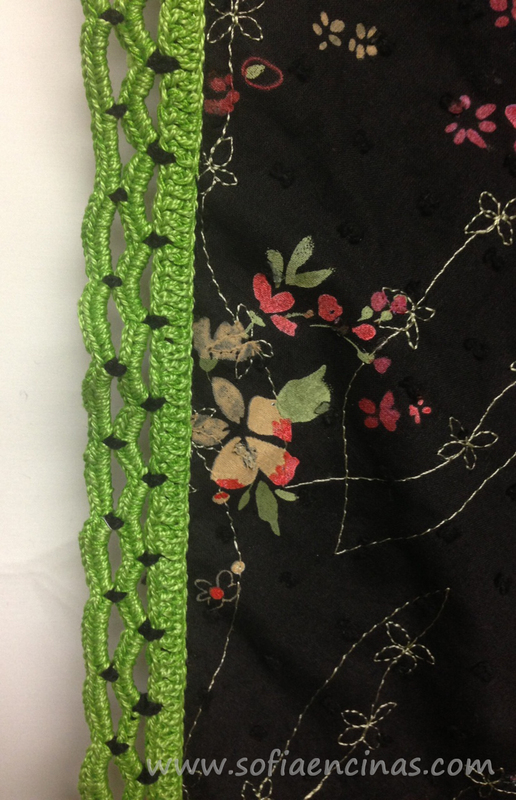 The next piece is a Black Printed Scarf with Green Crocheted Trim. 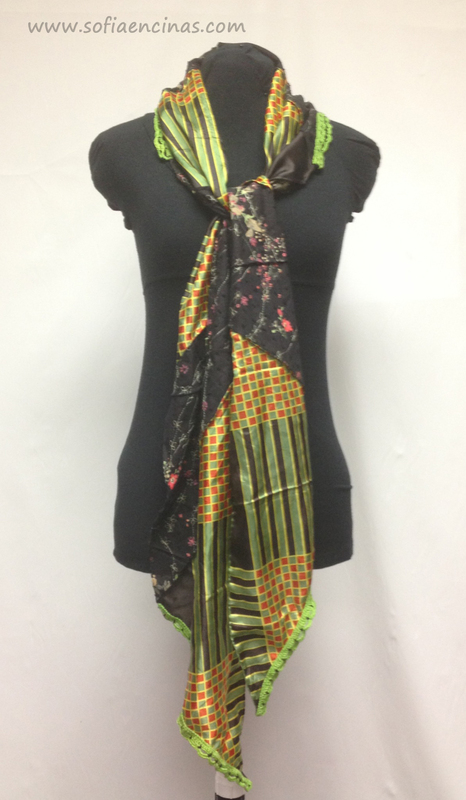 This beautiful scarf is a mixture of vibrant colors such as red, yellow, green and pink on a black background. This scarf was made out of two of my favorite blouses that no longer fit. One vintage style shirt with the simple pattern of strips and colored boxes, mixed with a shirt that had patterns of flowers and leaves on a black background. 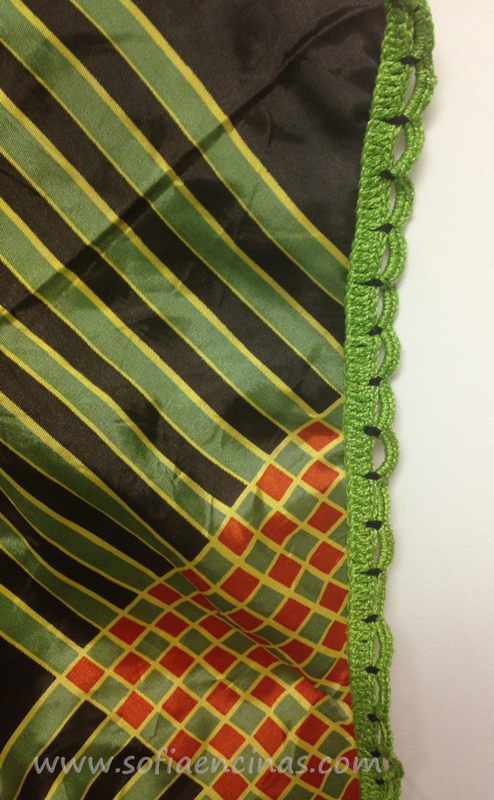 I added to the style and beauty of this upcycled scarf by giving it green trim that I crocheted along all the edges. 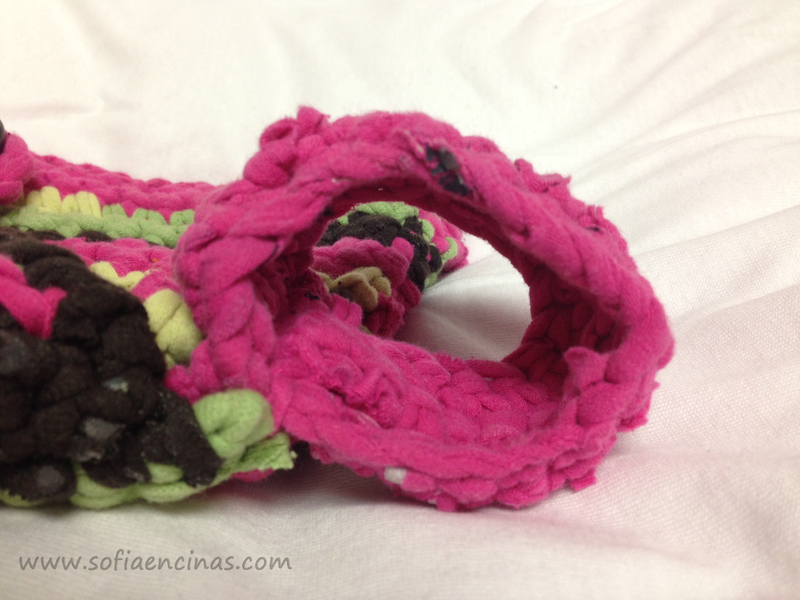 This scarf is handmade and eco-friendly. Last but not least is our monthly sale item! 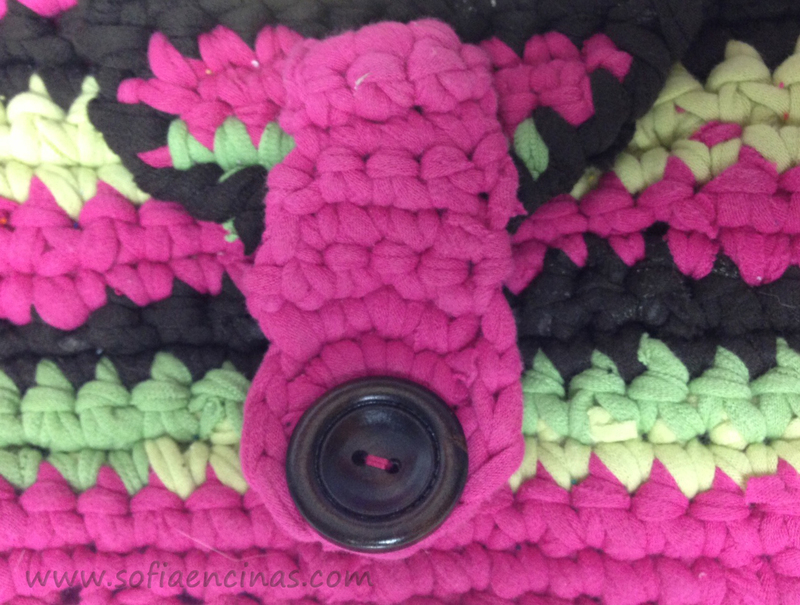 A Handmade Pink Clutch Purse and Matching Bracelet Made From Upcycled Crocheted T-Shirts. 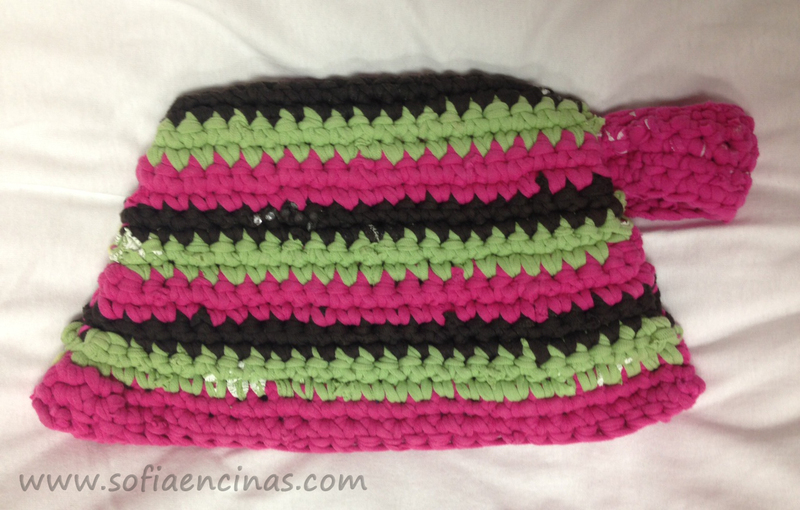 A cute little clutch purse made completely by hand out of upcycled t-shirts. This is a one of a kinda design that you won’t be able to find anywhere else. 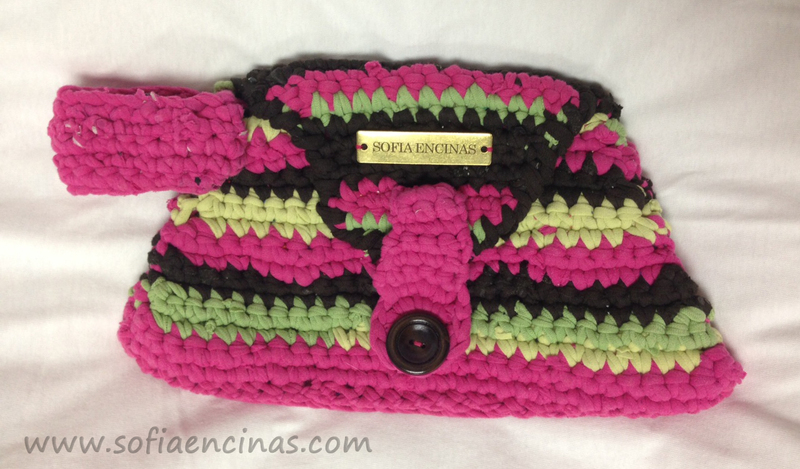 The purse has magenta, chocolate and green apple stripes with a flap that contains a big brown chocolate button to close. 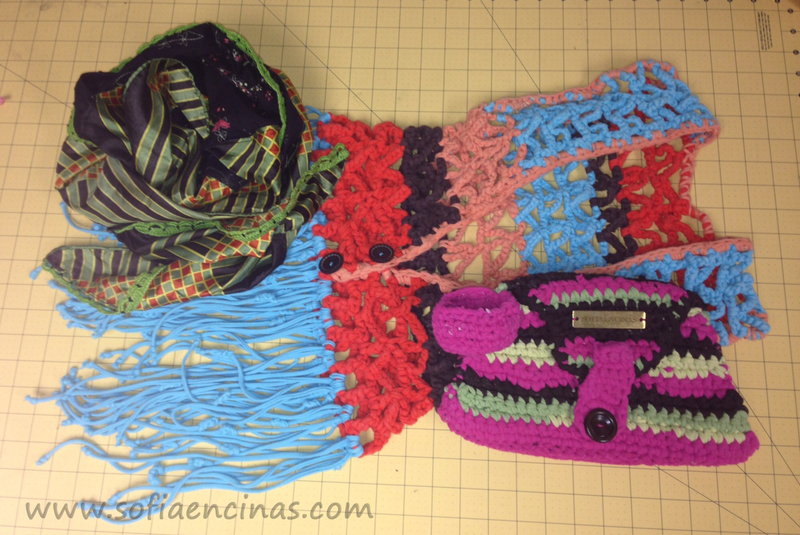 The bracelet is made out of the same t-shirts and coordinates perfectly with the clutch purse. It is completely magenta colored. The bracelet is 8in long and 2in wide. The clutch is 7.5in wide across the top and 11.5in wide across the bottom, as well as 7in high. Originally $42.00 this clutch and bracelet set is now on sale for $36.00 in our Etsy Store NOW! I would love to hear what you think! Would you want to keep your favorite T-shirt forever?? Please feel free to give suggestions, thoughts, comments, questions in the comments below! GET CREATIVE! This entry was posted in New Products! and tagged 2015, clutch, crafts, dresses, family friendly, fashion, fun, new, recycle, Recycling, scarf, style, upcycle, upcycling, vest.